It’s unfortunate that they get such a bum rap because in my experience, I’ve never met a pit bull-type of dog that I didn’t like. 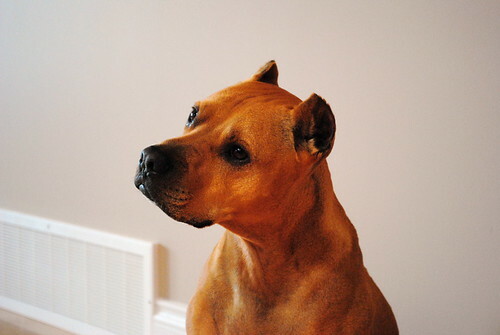 Interestingly enough, did you know that there is no one such breed that can be defined as a “pit bull”? “Pit bull” is a broad term, simply a label slapped on many of the dogs belonging to the molosser group of dogs [source], largely identified by a solid build, heavy bones, a short muzzle and pendant ears. Molosser dogs – or “pit bulls” if you will – include rottweilers, mastiffs, certain terrier breeds and American Staffordshire terriers like my cookie-loving, sweet buddy Jake, pictured below. Because of the general associations made with pit bulls, campaigning and championing for these dogs often comes with much adversity and challenge. One such pit bull, a smiley and gentle giant named Floyd, needs your help. Floyd was found malnourished and in severe pain due to a crooked muzzle, dislocated jaw and confinement in a small space. Thanks to the amazing people at HugABull, Floyd was given a second chance after some costly veterinarian bills and is now convalescing in a warm foster home. 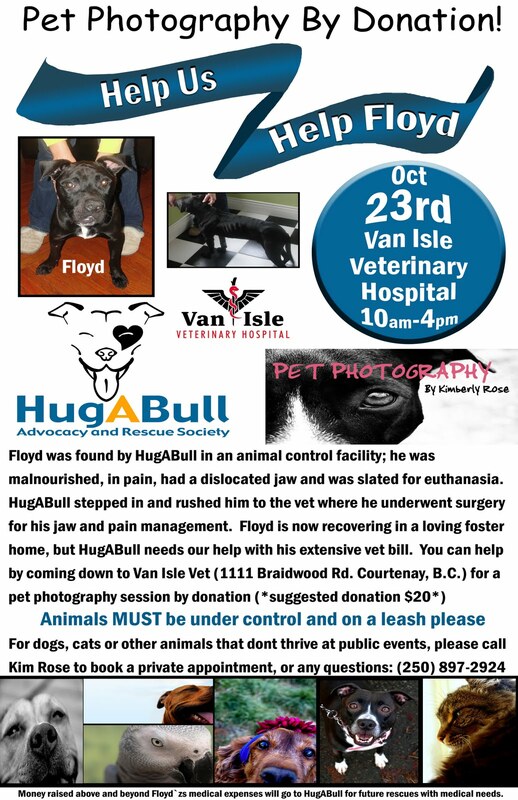 Comox Valley pet photographer, Kim Rose, felt a heart connection to Floyd after adopting her own pit bull from HugABull and is holding a fundraiser this Saturday, October 23 to generate cash to pay for Floyd’s veterinary expenses. Pets and their owners can visit the Van Isle Veterinary Hospital at 1111 Braidwood Road in Courtenay and have their pets’ photos taken by Kim by donation. All proceeds will benefit Floyd’s recovery, with any and all funds raised above that amount to be donated to HugABull to help other pit bulls who just need a break. Should you wish to visit Van Isle Veterinary Hospital and have your pet’s photo taken, Kim Rose requests that all animals be leashed and under control of its owner. While the photography is by donation, a donation of $20 is suggested. …and if there was ever any question as to just how cuddly and affectionate these dogs can be, look no further. Thanks for including this and the amazing work that HugABull does. The only time these misunderstood dogs seem to make the news is for the negative stories that are often not fully explained. I wish that people would focus more on the breeders and owners who need to take responsibility for some of the unfortunate cases. What a handsome dude he is. Like most people I’ve heard the bad rap that pittbulls get but I hope that they r all wrong. A friend of mine is getting a pitbull pup this Tuesday.